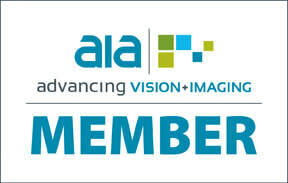 The FLIR Ax5 Series are an extremely affordable thermal imaging option. 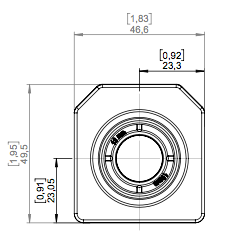 It is an ideal fit for an automation or machine vision environment. All models are extremely compact, perfect for mounting in locations of limited space. 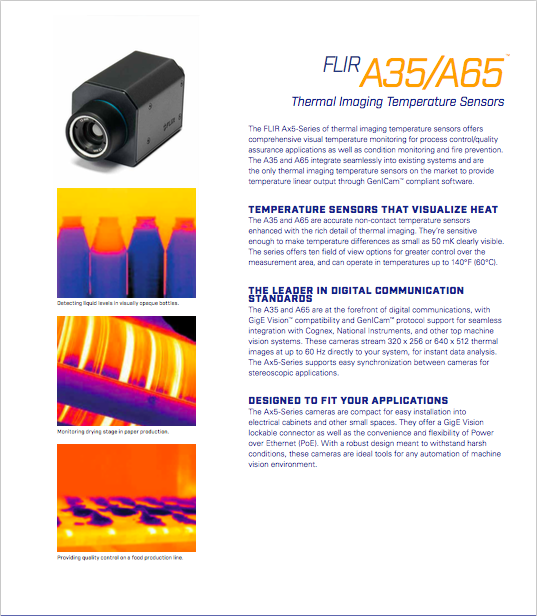 FLIR's Ax5 Series models are low-cost thermal imaging temperature sensors that are ideal tools for monitoring temperatures in automation or machine vision. The FLIR Ax5 Series produces high quality thermal images that can show temperature differences as small as 50 mK. 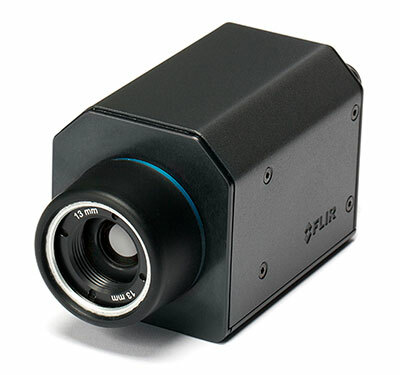 Record crisp 640 x 512 pixel thermal images with the FLIR A65, or for less precise applications, the A35 generates a 320 x 256 pixel thermal image that still allows you to easily track temperature changes. 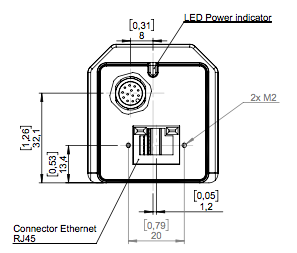 GigE Vision is a camera interface standard developed using the Gigabit Ethernet communication interface. GigE Vision is the first standard to allow for fast image transfer using low-cost standard cables, even over long distances. The goal of GenICam is to provide a generic programming interface for all types of cameras. This protocol also makes it possible to use third party software with the camera. 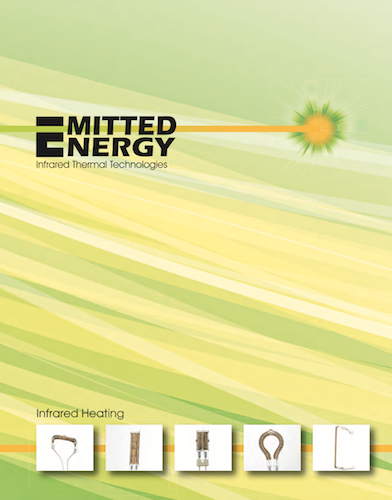 Allows for non-contact temperature measurement within any third party software. A built-in Gigabit Ethernet connection allows real time 14-bit image streaming to a computer. 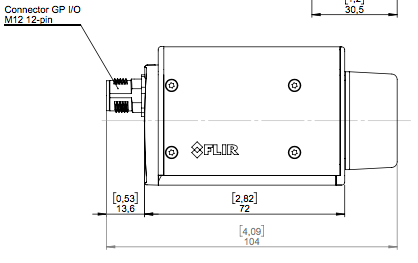 The FLIR A35 & A65 may be ordered with one of five lens options each. Below are field of view calculators for each camera/lens option. 1. Vertical field of view in meters and feet. 4. Depth of field far limit in meters and feet. 2. Instantaneous field of view in mm and in. 5. Depth of field near limit in meters and feet. 3. Horizontal field of view in meters and feet. 6. Distance to target in meters and feet. Enter a comma-separated distance string (max. 8 values). D 1.64 3.28 6.56 16.39 32.79 81.97 163.93 327.87 ft.
HFOV 0.69 1.38 2.76 6.90 13.81 34.51 69.03 138.05 ft.
VFOV 0.55 1.10 2.21 5.52 11.04 27.61 55.22 110.44 ft.
DOF near 1.51 2.82 4.96 9.11 12.64 16.45 18.29 19.38 ft.
DOF far 1.79 3.91 9.63 79.6 Infinity Infinity Infinity Infinity ft.
IFOV 0.03 0.05 0.10 0.26 0.52 1.30 2.59 5.18 in. HFOV 1.46 2.91 5.83 14.57 29.14 72.86 145.72 291.44 ft.
VFOV 1.17 2.33 4.66 11.66 23.32 58.29 116.58 233.15 ft.
DOF near 1.20 1.91 2.70 3.59 4.04 4.36 4.48 4.54 ft.
DOF far 2.55 11.27 Infinity Infinity Infinity Infinity Infinity Infinity ft.
IFOV 0.05 0.11 0.22 0.55 1.09 2.73 5.47 10.94 in. HFOV 1.75 3.50 6.99 17.49 34.97 87.43 174.86 349.73 ft.
VFOV 1.40 2.80 5.60 13.99 27.98 69.95 139.89 279.78 ft.
DOF near 1.03 1.50 1.96 2.39 2.57 2.70 2.75 2.77 ft.
DOF far 3.95 Infinity Infinity Infinity Infinity Infinity Infinity Infinity ft.
IFOV 0.07 0.13 0.26 0.66 1.31 3.28 6.56 13.12 in. HFOV 0.37 0.75 1.50 3.75 7.49 18.74 37.47 74.94 ft.
VFOV 0.30 0.60 1.20 3.00 6.00 14.99 29.98 59.95 ft.
DOF near 1.60 3.13 6.01 13.39 22.65 38.7 50.7 60.0 ft.
DOF far 1.68 3.44 7.21 21.12 59.2 Infinity Infinity Infinity ft.
IFOV 0.01 0.03 0.06 0.14 0.28 0.70 1.41 2.81 in. HFOV 0.22 0.44 0.87 2.19 4.37 10.93 21.86 43.72 ft.
VFOV 0.17 0.35 0.70 1.75 3.50 8.74 17.49 34.97 ft.
DOF near 1.62 3.22 6.35 15.17 28.26 58.6 91.2 126.4 ft.
DOF far 1.65 3.33 6.78 17.83 39.0 136.2 802.7 Infinity ft.
IFOV 0.01 0.02 0.03 0.08 0.16 0.41 0.82 1.64 in. HFOV 0.71 1.43 2.85 7.13 14.27 35.67 71.34 142.69 ft.
VFOV 0.57 1.14 2.28 5.71 11.42 28.54 57.08 114.15 ft.
DOF near 1.59 3.08 5.82 12.48 20.17 31.99 39.8 45.3 ft.
DOF far 1.69 3.50 7.50 23.85 87.2 Infinity Infinity Infinity ft.
IFOV 0.01 0.03 0.05 0.13 0.27 0.67 1.34 2.68 in. HFOV 1.37 2.74 5.49 13.72 27.44 68.60 137.20 274.40 ft.
VFOV 1.10 2.20 4.39 10.98 21.95 54.88 109.76 219.52 ft.
DOF near 1.47 2.66 4.47 7.59 9.89 12.09 13.05 13.59 ft.
DOF far 1.86 4.27 12.20 Infinity Infinity Infinity Infinity Infinity ft.
IFOV 0.03 0.05 0.10 0.26 0.51 1.29 2.57 5.15 in. HFOV 2.38 4.76 9.51 23.78 47.56 118.91 237.81 475.63 ft.
VFOV 1.90 3.81 7.61 19.03 38.05 95.13 190.25 380.50 ft.
DOF near 1.17 1.82 2.53 3.29 3.66 3.92 4.02 4.07 ft.
DOF far 2.73 15.74 Infinity Infinity Infinity Infinity Infinity Infinity ft.
IFOV 0.04 0.09 0.18 0.45 0.89 2.23 4.46 8.92 in. HFOV 0.36 0.71 1.43 3.57 7.13 17.84 35.67 71.34 ft.
VFOV 0.29 0.57 1.14 2.85 5.71 14.27 28.54 57.08 ft.
DOF near 1.63 3.23 6.36 15.25 28.53 59.7 94.0 131.9 ft.
DOF far 1.65 3.33 6.76 17.72 38.5 130.4 635.4 Infinity ft.
IFOV 0.01 0.01 0.03 0.07 0.13 0.33 0.67 1.34 in. HFOV 0.18 0.36 0.71 1.78 3.57 8.92 17.84 35.67 ft.
VFOV 0.14 0.29 0.57 1.43 2.85 7.13 14.27 28.54 ft.
DOF near 1.63 3.26 6.49 15.97 31.16 72.6 130.2 216.1 ft.
DOF far 1.64 3.30 6.63 16.84 34.6 94.2 221.2 678.8 ft.
IFOV 0.00 0.01 0.01 0.03 0.07 0.17 0.33 0.67 in. 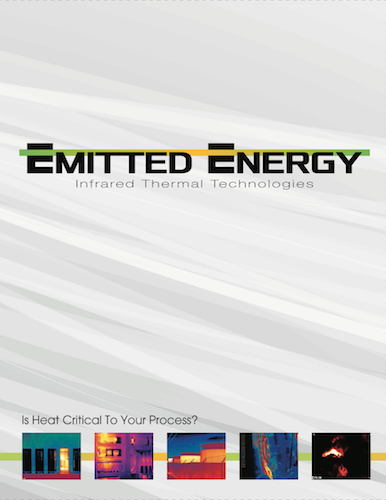 ​© EMITTED ENERGY CORPORATION 2018.